Supporters of Lady in the Lake killer Gordon Park are holding a vigil near the prison where he is serving a life sentence for murdering his wife. Family and friends of Park, 63, gathered in Manchester. He is serving his sentence at the former Strangeways prison, now HMP Manchester. 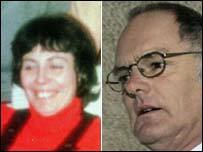 Park was jailed in 2005 for killing his first wife Carol and dumping her body in Coniston Water in the Lakes in 1976. His current wife Jenny was due to lead the vigil. The retired teacher, who is from Barrow in Cumbria, was found guilty of the murder in January 2005, but has always maintained his innocence. Mrs Park was dubbed the Lady in the Lake by detectives after the Raymond Chandler crime novel of the same name. A jury at Manchester Crown Court heard Park bludgeoned his wife to death with an axe, then dumped her body in Coniston Water where it lay undiscovered for 21 years. The jury dismissed his not guilty plea after a 10-week trial.